I don't know about you but I don't watch the weather for how I might need to dress on any given day. No, I tune in at 6:15 each night to see what the local weather-guesser guy or gal has to say about the fronts and storms that might deposit new feathered fallout in my neck of the woods. This past week the weather was fit for neither man nor beast! Well, most beasts-- The low pressure system that sat like a fat brooding drooling bear over the southeast and the frigid weather that froze over the northern tier like the next glaciation, combined forces to push waves of waterfowl further south. Having experienced perhaps the worst duck numbers on a Christmas Bird Count I can remember since 1985, I was happy to finally see my fast-flying, web-footed friends falling from the heavens to flavor the local wetlands and the New Year. And so with the skies darkened and the rain falling for most of last week I thought I'd take a few moments to pay homage to the ducks and the birder-hunters who pursue them passionately. I'm not sure there are any other sportsmen that love their quarry and give to conservation like waterfowlers do. Yes, the history of waterfowling is a storied and sometimes sad one with absurdly large - bored punt guns and market hunting decimating populations of many species, waterfowlers were more nefarious than anything. With hundreds of ducks falling to a single shot and no laws to limit the wanton killing, canvasbacks and many other species declined to such low levels that extinction became a distinct possibility. The "good ol' days" of killing with no limit over the chilly Chesapeake or some South Carolina backwater weren't so good. Something needed to be done or other species would follow the Labrador duck to "Never-Ever-Again Land". The key thing about history is knowing it so you won't repeat it, right? And so there were those who paid attention. Folks like Teddy Roosevelt, George Bird Grinell and cartoonist Ding Darling wanted things to change and put political will, money and even the pen to work. They saw waterfowl not only as beloved quarry but as beautiful birds that connect the continent--North to South and East to West in wetlands beset with whistling wings and the clamor of quacking. The first half of the twentieth century saw legislation--the Lacey Act of 1900, the Federal Migratory Bird Act of 1918, and The Duck Stamp Act of 1934 enacted on behalf of all wildlife. Then the Federal Aid in Wildlife Restoration Act (better known as Pittman -Robertson), enacted at the tail end of the Great Depression, made sure that many of those who used the resource paid their way. With taxes levied on firearms and ammo, money went back to the states to restore decimated wildlife populations. Make no mistake, birds provided much of the impetus or the change. Among all bird species, waterfowl waddled in front as emblematic leaders in the push to conserve. We all know (or should know by now) how important waterfowl and modern waterfowlers have been in generating dollars through duck stamp purchases and the wetland management initiatives they support. Dollars in the name of ducks are counted in the billions and acres of wetlands protected in the millions. The efforts not only help ducks but a myriad of other critters- feathered, furred and finned that you and I enjoy. And so I raise my binoculars to the ducks and the people who pursue them! 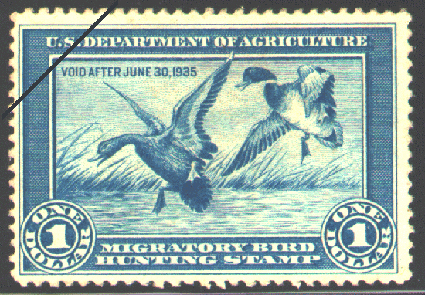 The first duck stamp. The beginning of a conservation success story! There is so much rich legacy that waterfowlers have given us. I love (most of) the colorful and descriptive names given to waterfowl by duck hunters. Everyone knows what a "greenhead" is. The avian aliases often impart a different flavor to the birds and in many instances helps us to know them even better. And yes you read me right earlier! I am declaring duck hunters as fellow birders! Think about it. Most waterfowlers are incredible observers who will awe you their ability to identify waterfowl at tremendous distances -- often in the limited light of dawn or dusk; and in bad weather--without binoculars. It is gestalt birding at its best! In some states one must pass proficiency tests in order to gain hunting privileges. What's more their love of the birds they hunt leads them to know more about the ecology of their quarry than most other birders I know. Mad props to those who pursue and leave much more intact than they take home in the game bag! I thought of all of this as the rain came down in sheets last week. It rained and it poured. And then it rained and it poured some more--for five straight days. With the pitter-patter of precipitation rhythmically pounding outside, I was inspired to turn my attention to the feathered creatures that probably appreciate it most. 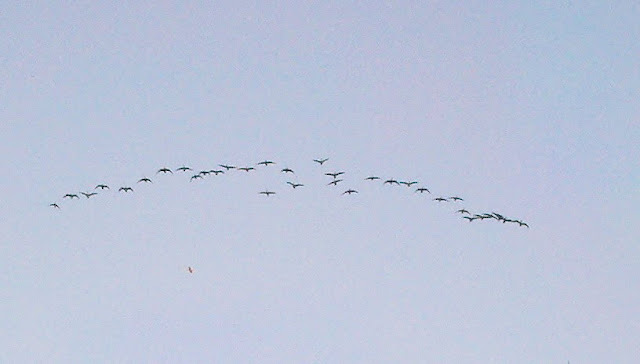 And so here it is--my meteorological musings --an ode to the waterfowl and the birders and waterfowlers who love them. 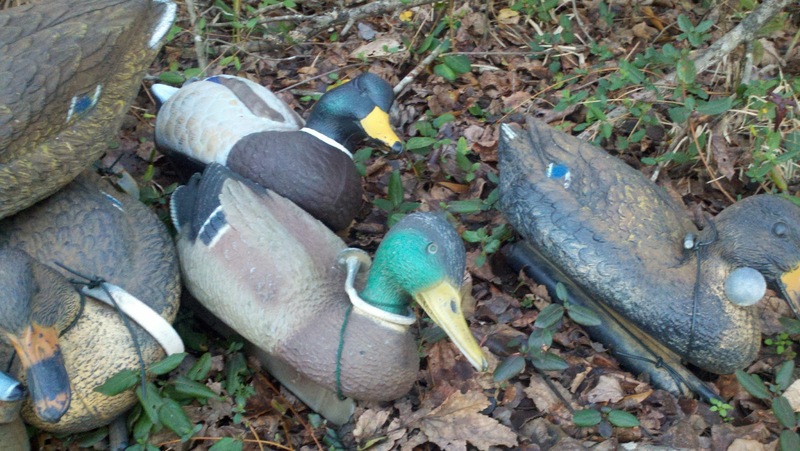 Can you match the hunter names to the dandy dozen ducks in the forecast! Do you have other old names for ducks you'd like to share? By all means please do! Oh yeah. wanna do YOUR part for duck conservation? Buy a stamp! My good friend and birder-conservationist Paul Baicich passionately preaches the "Put-your-money-where-your-mouth-is-birders-and-buy-a-duck-stamp!" message on a daily basis. 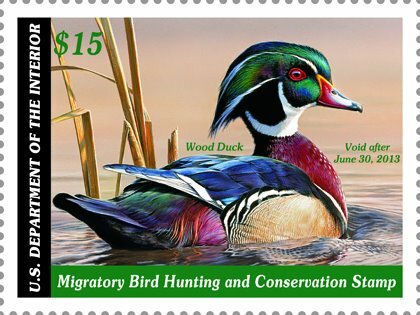 I'm a believer and a duck stamp buyer. You should be too! Put in! It's the best $15 you'll spend! Draining the broody sky in torrents. precipitation pumping ponds and puddles past full. The rivers are roaring and flocks of ducks are boiling. Redheads, Bluebills and Greenheads will fall heavily from the clouds to find the failing freshets refilled. Sprig, Spoonies and Summer Ducks will sprint through the showers and the tiniest smiler Teal will squeal in the torrent to the deluge's delight. Gray ducks love the gads of rain too. The Specks won't give a heck if it rains from now until. The Baldpate and Butterballs should bobble ebulliently on rising waters and word is that the Cans can't get enough and proclaim it to be a drearily dreamy ducky day. Proud duck stamp buyer, at least for the last two years. I'm embarrassed to say that I'd never heard of them prior to that.